National Learn To Play Day returns in the UK on 16 March, again offering the chance for anyone and everyone to head down to their local music store for a free musical instrument lesson. Amongst other supporting the event, comedian and drummer Al Murray will be giving drum lessons at Chappell's in London's Bond Street. Check out the press release below for full details. Press release: Music stores all over the UK will be offering everyone free taster music lessons, across a huge range of instruments from guitars, pianos and drums to ukuleles, saxophones and bassoons, on National Learn to Play Day, Saturday 16th March 2013. Comedian and drummer Al Murray, and a host of other rock stars, musicians and celebrities, have lent their support to the campaign, which aims to give anyone who'd like to try their hand at making music, the opportunity to do so. The event is timely as a recent survey by Arts Council England's 'Take it away' scheme, in conjunction with parenting website Netmums, found that nearly three-quarters of parents (73%) thought access to a free taster lesson would be a good way to encourage their child to take up an instrument. Announcing his support of the campaign, Al Murray said; "I am really pleased to be able to be involved with this initiative. Learn to Play Day has to be one of the best ideas I have heard of in a long time. Playing a musical instrument is life enhancing as well as huge fun! Giving a child - or anyone - the opportunity to play is giving them a gift for life, and the chance to have a free taster session on virtually any instrument has to be a great start!" "The event is designed to welcome people into music shops and inspire them to get playing" said Paul McManus, CEO of Music for All, "People are often surprised to discover that they ARE musical and simply need a musical "experience" to get them started." "We ran the first Learn to Play Day last year in just 60 stores and reckon that over 10,000 people enjoyed a free taster lesson with a huge number, up to 40% in some areas, continuing their interest afterwards. This year will be a much bigger, truly national event, with people having an opportunity to try an instrument in many more music stores all over the country." As well as Al Murray, a number of musical celebrities have lent their support to the Learn to Play Day, including Pink Floyd's Nick Mason. Commenting on the National Learn to Play Day Nick said; "Learning to play an instrument is something rather more than a passport to a TV talent show. And it doesn't have to be a Fender Strat or a Steinway Grand to join... For the price of a ukulele or tin whistle you can both make and impress friends - and enjoy yourself more than you can possibly imagine. I know this - I've been doing it for 45 years now, and it still doesn't feel like a job!" 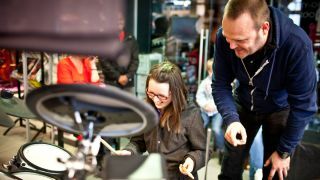 Al Murray, supported the first Learn to Play Day in 2012 by giving drumming lessons at Chappell's of Bond Street in London on the day. He will be doing the same again this year, and said of the event; "It was brilliant! All these people who dreamed of being the next Phil Collins or Nick Mason had a go and many of them enjoyed it so much they went away confident that they would carry on drumming."